Great deal alert!! Featuring the perforated trend that is so very hot (pun intended) for summer, the popular lace up closure, peep toe front, and faux-leather upper, this ModCloth Perforate and See Wedge is a summer must. Don't be fearful of the 4 1/4" heel, it is a wedge after all; it's sure to be more comfortable than the typical 4 1/4" heels and the best part, this baby is only $39.99. Naturally, because of this awesome price, it will be going fast, so get on it ladies. 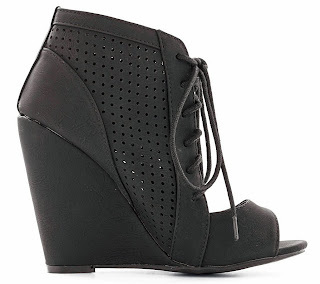 Grab your own ModCloth Perforate and See Wedge HERE.